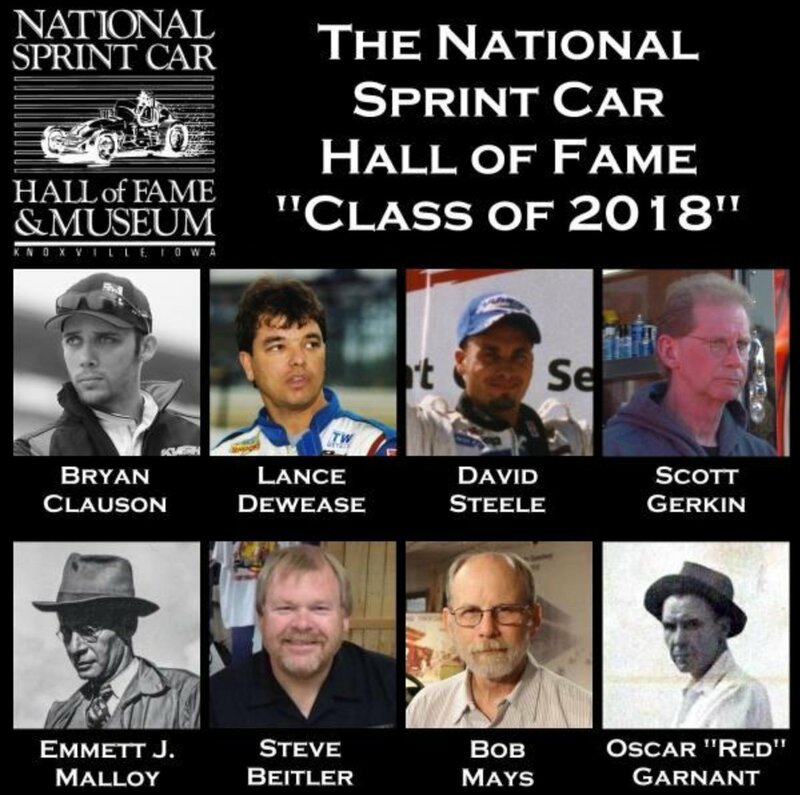 Tuesday, January 09, 2018 – The National Sprint Car Hall of Fame is pleased to announce the names of its eight inductees for 2018.These names will be inducted into the National Sprint Car Hall of Fame on Saturday, June 2. Bryan Clauson – Despite passing at the age of 27, Bryan’s impact on sprint car racing was already indelible. He was a two-time USAC sprint car champion and Driver of the Year. He won 41 USAC National sprint car features, and was a two-time Indiana Sprint Week Champion. After switching to wing racing, he held wins with the All Stars, the National Sprint League, ASCS and on Friday night at the Knoxville Nationals, one of the two years that he put himself in the Knoxville Nationals championship race. Bryan would also qualify for the Indianapolis 500 three times! Lance Dewease – One of the legends of the central Pennsylvania circuit, Lance Dewease is still going strong. In limited action, he posted 12 wins in 2017 alone, including the $50,000 to win Tuscarora 50 at Port Royal, and the Kasey Kahne “Dirt Classic” at Lincoln Speedway in September. Lance has over 320 wins in a career that has been rejuvenated by teaming with fellow Hall of Famers Don Kreitz Jr. and Davey Brown Sr. Lance has won at least one sprint car feature since 1986 (32 years)! He is a six-time champion at both Williams Grove Speedway and Port Royal Speedway. David Steele – David Steele may well have been Florida’s most accomplished short-track racer before his passing in 2017. The two-time USAC Silver Crown champ started with wing racing, taking the 1994 Florida 500 at Charlotte County Speedway at the age of 19. Dave racked up 60 USAC National wins, including 26 in sprint cars. Dave also won the prestigious “Little 500” in Anderson, Indiana twice. Closer to home, he won an even 100 feature wins in Florida alone, and was a three-time Tampa Bay Area Auto Racing Association (TBARA) champion. Scott Gerkin – Scott began his mechanical career in sprint cars in 1977. He would work under the tutelage of Hall of Famer Karl Kinser and his drivers, Mark and Steve Kinser. With Steve Kinser Racing, Scott helped to build the team from the ground up in 1995, winning eighteen features including the Historical Big One at Eldora, at Syracuse, New York on the mile and the Knoxville Nationals that year. The next twenty years would see the team win six World of Outlaws championships, two Knoxville Nationals, four King’s Royal titles and well over 150 WoO feature wins with Scott as crew chief. Scott was awarded the Ted Johnson Memorial Award for Outstanding Contribution to Sprint Car Racing in 2014. Scott is currently the head engine builder at One Way Technologies. Emmett J. Malloy – After hopping a train west from his home in New Hampton, Iowa at the age of 17, Emmett eventually settled in Inglewood, California. An excavator, Emmett would build and operate the famous “Gardena Bowl”, home to first the California Roadster Association, which morphed into the California Racing Association (CRA). Emmett would also become a championship car owner. He hired legendary builder and mechanic Bob Pankratz and Hall of Fame driver Troy Ruttman. After winning 26 features in two years, Emmett concentrated on Indianapolis, and was competitive despite a lower budget than many of his competitors. From track builder/operator to car owner, Emmett left a permanent imprint on the history of sprint car racing in the United States. Steve Beitler – Steve has dedicated over 40 years to the sport of sprint car racing, over 22 as an owner/driver. The past two decades has seen Steve owning and promoting Skagit Speedway near Alger, Washington. Steve has also promoted at Grays Harbor Raceway in Elma, WA and State Fair Speedway in Yakima, WA. Skagit was special to Steve as his father Harold raced in the first events there, and he sold programs and National Speed Sport News there at the age of eight. Despite its location in the Pacific Northwest, Skagit hosts some of the major events in the country including the Jim Raper Memorial Dirt Cup. The World of Outlaws and the ASCS National Series are annual visitors as well. Steve has been the recipient of over twenty promoter and community service awards. Bob Mays – Bob’s interest in racing began at the age of three when his father took him to Capitol Beach Speedway in his hometown of Lincoln, Nebraska. After racing for a few seasons in a micro-midget, fortunately, Bob picked up a camera. Bob would travel and shoot, becoming the track photographer at Midwest Speedway in Lincoln, and shooting for several publications including Open Wheel, Hawkeye Racing news, Western Racing News, National Speed Sport News and many more. Bob has contributed to many publications over the years both with photos and with print. He has authored “High Plains Thunder”, Supermodified Racing in the Midlands, Valley County Thunder: The History of Racing at Ord, Nebraska, Big Car Thunder: Volumes One and Two, Competition Portraits, and last year’s “The High Banks! Belleville’s Amazing Track and the Men Who Tried to Tame Her”. In 2006, Bob was an inductee in the Belleville Highbanks Hall of Fame. Oscar Dwain “Red” Garnant – Born in 1904 in Cedar Rapids, Iowa, Red followed his older brother and fellow Hall of Famer Russ to California and into racing. He learned the mechanical end of the “Big Cars” at Ascot Legion Speedway in the 1920’s. At pit mechanic under his brother, he wrenched on the famous “Garnant” Simplex Piston Ring Special driven by Stubby Stubblefield and Mel Kenealy among others. In 1929, the team took 13 races at Ascot, including eight in a row with Kenealy. The team won eight straight in 1930 with Stubblefield at the wheel. The wins and great drivers such as Rex Mays just kept coming for the Garnant’s. After World War II, Red stepped away from racing, but used his mechanical prowess to build the original molds of the Frisbee and the Hula Hoop in the 1950’s. The Frisbee was the size of a small steering wheel and the Hula Hoop a car’s wheel.